Aussie Greg Fryer produced three very close copies of Brian's Red Special guitar - these were commisioned by Brian. Greg also masterminded the restoration of the Old Lady herself to get Brian's faithful playing companion back into top condition. In late 2000, Greg launched his own line of Brian May equipment, with Brian's endorsement. The guitars and the commercial products available are detailed below. Greg is best known for his three copies of the Red Special which were commissioned by Brian and are known as John, Paul and George Burns. These great copies have become Brian's backup guitars, replacing his Guild copies. Brian has two of these guitars - one (John) is a near-perfect copy of the original Red Special and the other (George Burns) is an all-rosewood version which has a slightly harder and more modern sound. Greg Fryer has kept the third copy (Paul), which is also an exact copy of the Red Special. Greg did a huge amount of research to ensure that his guitars were the closest possible replicas of Brian's original. Unfortunately, these guitars are not commercially available. 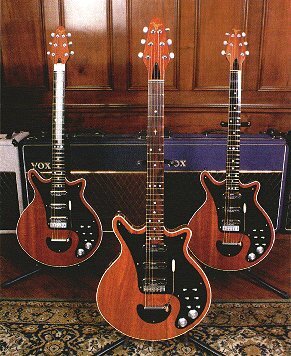 Click here for an article on these guitars and Greg Fryer's restoration of the Red Special itself. Greg is selling a range of pedals, which are aimed at guitarists who want to get the ultimate Brian May tones. Four models are currently available: the Ringmaster, Treble Booster, Mayhem and Purple Maze. The Ringmaster pedal is a copy of Brian's original Treble Booster, the legendary Rangemaster. This was used on the early Queen albums (up to A Day At The Races) and has a characteristic 'raw' sound compared to Brian's later work. Greg's pedal is an update of the Rangemaster circuit, which aims to reproduce the essential tonal qualities with reduced noise and improved reliability. The Treble Booster is Greg's updated version of Brian's current treble booster. It features lower noise levels and improved reliability over previously available models (such as the short-lived Guild copies). Used in conjunction with a Vox AC30, this pedal is designed to give truly authentic Brian May tones. A slightly modified version known as the Treble Booster Plus is also now available, to accurately capture the richer, more sustained tones Brian used in the late-70s. The Mayhem pedal is a unique unit which aims to capture all of Brian May's trademark sounds without the need for an AC30 at full volume. It can be used in conjunction with the Treble Booster or Ringmaster to get full-blown AC30 tones at reduced amp volumes. It is also designed to reproduce the 'Deacy Amp' tones which Brian uses for his guitar orchestrations. Two versions of this pedal are now available, Red and Blue. The original red version is designed to work best with a Vox AC30, whilst the blue version offers a warmer more sustained tone, which will work well with a wide range of amplifiers. As the name implies, this pedal is designed to reproduce the famous guitar tones of both Jimi Hendrix and Brian May. With lower gain settings it produces a very credible 'Deacy amp' sound. Winding up the gain gives Hendrix's famous raw Fuzz-face into Marshall Stack sound. This pedal can be used either in front of a guitar amplifier or recorded direct. In addition to the Brian May pedals, Greg is now offering two new units based on his experience with the Brian May pedals. These are designed to give a range of great tones with a variety of different guitars and amps. 'Sweet Stuff' is a clean-boost pedal, which gives tones similar to the classic Ibanez Tube Screamer. 'Pink Maze' is designed to give vintage valve amp tones for that 'clean but overdriven' sound.